What Does 'Inverted Yield Curve' Mean? Question: What is a yield curve, and what does it mean when it's inverted? Answer: In simple terms, the yield curve shows the price of borrowing money in the bond market. In a "normal" yield curve, long-term yields are higher than short-term yields. This makes sense because the longer someone borrows your money, the more you would expect them to pay you. If you are familiar with annual percentage rates on certificates of deposits, you understand how the time premium works. The interest rate on a five-year CD is almost always higher than the rate on a one-year CD, which is higher than the rate on a 30-day CD. Why? When you put your money in a CD, you are lending it to a bank. The bank promises to pay your money back, with interest, at the end of the term. You don't know whether CD rates will move higher or lower over that term, but there's definitely more uncertainty over five years than there is over 30 days. If you lend the bank your money for five years, you want to get paid enough to compensate yourself for the fact that you might have forgone the opportunity to lend money at a higher rate before those five years are up. Of course, the opposite scenario could play out, and rates could be lower in the future. That's why people take the bet--though the interest rates on CDs are typically pretty low compared with riskier instruments, you've locked in a guaranteed return (unless you withdraw early and pay a penalty). Similarly, when you invest in bonds of longer maturity, you would expect to be compensated more for lending your money for a longer period of time. 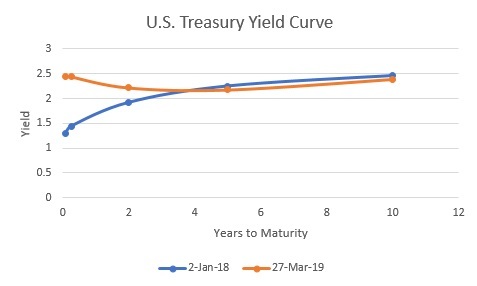 Look at the two yield curves below--the blue one is from January 2018 and the orange one is from Wednesday. At the beginning of 2018, we had a more typical yield curve. If you follow the blue line, you can see that the yield on the three-month Treasury (1.4%) was appreciably lower than the yield on the 10-year bond (2.5%). When you follow the orange line, though, you can see that the spread between shorter-term bonds and bonds of longer maturities has shrunk considerably since January 2018. Notably, the curve has dipped negative: The yield on a three-month Treasury (at 2.4%) is higher than the yields on intermediate-term bonds--even 10-year Treasuries are yielding a few basis points less. It's not so difficult to understand what's going on at the short end of the curve: This is the part over which the Fed exercises more direct control. At the beginning of 2018, the Fed funds rate was at a range of 1.25%-1.50%. The Federal Reserve has raised rates four times since then--in March (to a range of 1.50%-1.75%); in June (to 1.75%-2.00%); in September (to 2.00%-2.25%); and in December (to 2.25%-2.50%). What's going on at the long end of the yield curve gets complicated, though. This is the part of the curve that is more influenced by investors' expectations, including market sentiment and inflation expectations. The market has been a wild ride in the past few months: After selling off sharply in the fourth quarter of 2018, equities have had a healthy rebound so far in 2019 and have nearly regained their lost ground. And inflation expectations have slackened a bit, from around 2% at the start of 2018 to 1.8% on March 26, 2019, according to the break-even inflation rate, which compares the yield on nominal Treasuries to the yield on Treasury Inflation-Protected Securities of a similar maturity to estimate the market's inflation expectations. Also, importantly, even though the yields on Treasuries might look measly to a U.S. investor, low interest rates on global developed debt is helping to anchor the long end of the curve. To say that an inverted yield curve signals an economic slowdown is imminent is an oversimplification. But it does point to a risk in our current financial system: A flatter yield curve can hurt lenders' profits and stability and their willingness to lend. If long-term and short-term rates are close, markets must be expecting little growth or lenders would demand a bigger time premium. At Morningstar, we don't recommend that investors retool their portfolios just because the yield curve is not following its normal path. That said, it's not a bad idea to check in on whether your portfolio is well positioned to weather a rough patch. For an example, see Christine Benz's Bucket portfolios. The basic premise of the Bucket concept is that assets needed to fund near-term living expenses ought to remain in cash and other safe, liquid short-term assets. Money that you won't need for several years or more, meanwhile, can be invested in a diversified pool of long-term investments such as equities, with the cash buffer providing the peace of mind to ride out periodic downturns in the longer-term portfolio.